What is the matter with this Oshiomhole sef? Whose script is he reading from? This is very embarrassing to Nigeria. WASHINGTON, DC – July 29 – U.S. officials have vehemently denied ever telling a Nigerian Governor who accompanied President Buhari to Washington, DC, for a meeting with President Obama from the 19th-22nd of July, that a minister in the former Goodluck Jonathan administration stole $6 billion. The allegation was made by Governor Adams Oshiomhole of Edo State. A call to high officials of the U.S. Department of State said no U.S. official ever made that kind of a statement. 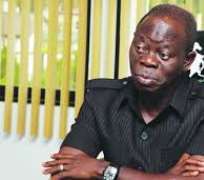 It would be recalled that since President Buhari took office, Mr. Oshiomhole has been on a crusade to implicate some former ministers in the former Goodluck Jonathan of stealing money. Mr. Oshiomhole has been on a running battle with the former Minister of Finance and Supervising Minister, Dr. Ngozi Okonjo-Iweala who he accused of withdrawing $2 billion from government accounts for Jonathan’s reelection campaign. Dr. Okonjo-Iweala who had served in the Obasanjo administration as Minister of Finance and Foreign Affairs, before resigning and being appointed Managing Director at the World Bank, from where she left again to serve her country, has denied the accusations. In May this year, after leaving office, Yale University honored Dr. Okonjo-Iweala with an award for her outstanding performance.